Light & Darkness Radio: Featured Today! "Axenstar, Delain..."
Have a blasting weekend! I want to thank all of you for your support and feedback! Feel free to send your requests, bands submissions and feedback! Here's the Featured bands of the day! Axenstar (SE) - Axenstar was formed by Peter Johansson (guitar) and Magnus Ek (bass) as a Metal-cover band 1998 under the name Powerage, after several member changes the line up that took the name Axenstar in 2001 was Magnus Eriksson (Vocals & Keyboards), Thomas Eriksson (Lead & Rhythm Guitar), Peter Johansson (Rhythm & Lead Guitar), Magnus Ek (Bass) and Pontus Jansson (Drums).In October 2002 Axenstar released their debut album Perpetual Twilight on the Spanish label Arise Records. The album got really good reviews all over the world and Axenstar got the chance to play at Motala Metal Festival, the biggest gig so far in their career. The second album Far From Heaven was recorded during May of 2003 and just about a week after the recordings were done Axenstar played at the mighty Sweden Rock Festival, which was a great experience for the band. 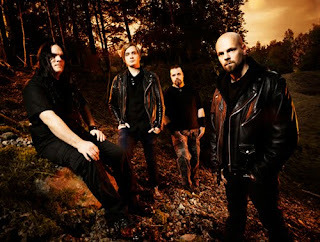 In January 2004 the opportunity was given to go ahead on their first European Tour as the opening act to Falconer, unfortunately Magnus Ek was unable to go on the tour and Joakim Jonsson (Skyfire, The Mist of Avalon) was found to be the stand-in bassplayer on the tour, which turned out great. The third album The Inquisition saw the light of day in 2005, but during this time and the time after the release there were some problems within the band and in late summer 2005 guitarists Peter Johansson and Thomas Eriksson left the band, not because of disagreements or anything like that but just personal reasons. After that third release the contract with Arise Records was over and Axenstar started looking for a new deal, now joining forces with Joakim Jonsson on lead guitar. In the autumn of 2005 a new deal was signed with German label Massacre Records and in the spring of 2006 the fourth album The Final Requiem was recorded as usual in Studio Underground. After the release of the fourth album there were more changes to come within the band and bassplayer Magnus Ek and drummer Pontus Jansson soon left the band due to lack of time. But already within a few months after the setback the two remaining members Magnus Winterwild and Joakim Jonsson found a new drummer by the name of Thomas Ohlsson. The search for a bassplayer started and Thomas contacted Henrik Sedell with whom Thomas had played together with previously. The chemistry with the two new members was great and everything was going well on both a personal and professional level. In June 2007 Axenstar did three shows in Sweden together with Nocturnal Rites that went really well. Then once again Magnus and Joakim were back to being the only members in Axenstar since both Henrik and Thomas left the band. The writing process then started with focus on a new album that were scheduled to be recorded in May of 2008. About 13 songs were written and 11 of them survived the cut and were recorded. In 2008 Magnus and Joakim recorded a new yet untitled album and in december 2008 drummer Adam Lindberg (Intrive) joined the band. A few months later guitarist Jens Klovegård (Liquid Suicide) also joined the band. In June 2010 a new deal is signed with German Rock It Up Records. The new album "Aftermath"was released in January 2011. Delain (NL) - Delain was founded by Martijn Westerholt and Charlotte Wessels. Westerholt is the ex-keyboardist and brother of one of the founders of Within Temptation, Robert Westerholt. He left Within Temptation in 2001 when he suffered from Pfeiffer's disease. Wessels was, at that time, an unknown singer living near Westerholt. They started Delain, as a project involving many of Westerholt's friends in the Symphonic Metal Community, in 2002, and began recording the debut album in July 2005, after they had signed a contract with Roadrunner Records. For their first album Lucidity they invited several well known musicians: Marco Hietala from Nightwish and Tarot (bass, vocals), Liv Kristine from Leaves' Eyes(vocals), Ariën van Weesenbeek from ex-God Dethroned, Epica (drums), Ad Sluijter from ex-Epica (guitar), George Oosthoek (growling) and Guus Eikens, both former members of Orphanage, Sharon Den Adel from Within Temptation (vocals) and Jan Yrlund from Imperia (guitar). Delain's first album Lucidity was to be released April 2006, but was postponed to the end of May and postponed again to 21 August before it was finally released on 4 September. Samples of their music have been released on their website, and full versions of the songs Sleepwalker's Dream and The Gathering, as well as the music video for the song Frozen. From Lucidity they released the singles Frozen, See Me In Shadow and The Gathering, the last one being a download-only single. With the success of Lucidity, Delain turned into a touring band, rather than a project. The band then consisted of Martijn Westerholt (keyboard) and Charlotte Wessels(vocals), the only two members who appeared on the album. Furthermore, the band consisted of Rob van der Loo (bass), Ronald Landa (guitar) and Sander Zoer(drums). At the end of 2007, Delain stated that they intended to release a second album in 2008, and began playing two new songs live, "Stay Forever" & "Start Swimming". In November 2008, it was announced on their official website that the new album, April Rain, would be released on 9 February 2009. Also, they played a new song on Dutch television called I'll Reach You. This turned out to be a different version of the song than would appear on the forthcoming album. Since then, April Rain has been released to coincide with foreign release dates. The first single from the album was the title track April Rain. The second single from this album was Stay Forever. In February 2010 Delain announced they had started working on their third album, and that bassist Rob van der Loo would leave the band the same year due to time constraints. In March Otto Schimmelpenninck van der Oije was announced as Rob's successor. In July 2010 they were the opening band at the Sonisphere Festival at Knebworth, UK. They opened on Friday 30 July on the Saturn Stage The band has been working on new material and plan to release a new album in 2011. On October 4, 2010 Delain announced they are to part company with guitarist Ewout Pieters on the 30th October and also announced that they are actively seeking a new guitar player. In February, 2011, the band launched their new website. In April 17, 2011, they announced in their official website and blog that the new guitarist will be Timo Somers. In 2011, Delain began playing three new songs with the working titles of "Manson", "Get The Devil Out Of Me" and "Milk And Honey"